One of the most anticipated festivals of the year, the Songkran Music Festival is back in town again! This two-day event is happening on the 14th and 15th of April from 3pm-8pm at Lightbox, Sungai Buloh. This event which was held last year was a huge success as it garnered tons of young participants. So this year around, they are back with full force to celebrate the Songkran festival. 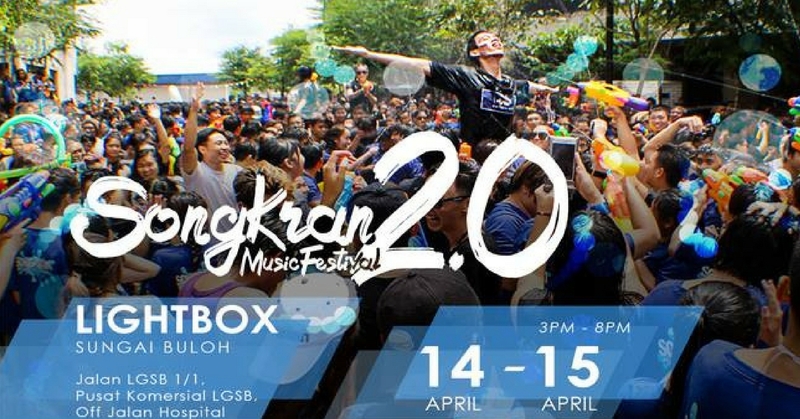 Unlike the typical Songkran celebration where water splashing and water guns are expected, Songkran 2.0 Music Festival has included a lot of fun activities to bring the celebration up a few notches. Participants can expect to have a day filled with fun as they have prepared an array of activities, such as Tug of War, Water Balloon Fight, DJ Performance, Photo Booth (Bricklane), Water Shooting Game (Bricklane), Dunk Tank, 40 m Waterslide, and more! Check out the full list of activities HERE. Sounds interesting already, isn’t it? For those who are not particularly fond of events like Colour Run or Glow Run, you might want to give this a shot. For those who are interested to be part of the Songkran 2.0 Music Festival, do take note that from now till 15th of March, the Early Bird ticket is up for grabs at RM 48 only (for standard package) or RM 63 only for upgraded package). The Early Bird promo is up till 500 pax only, so hurry up or else you’ll have to pay a little more for their normal price tickets. For more information, visit their Facebook page and get your tickets at their official website here.